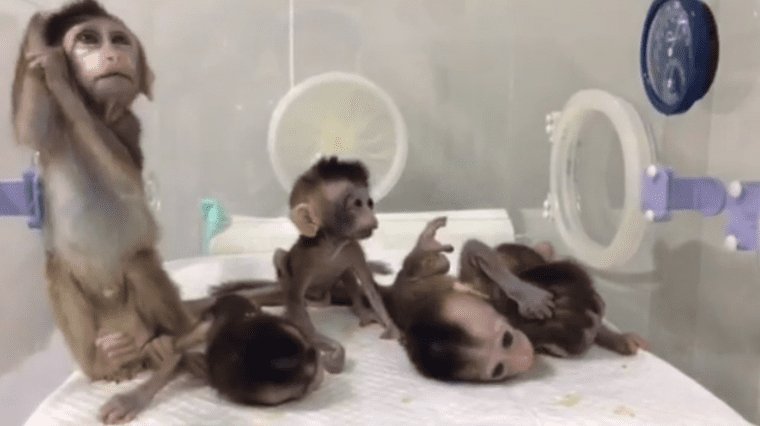 Five cloned monkeys have been born with a host of genetic mental health conditions in a controversial experiment in China. The monkeys - all clones of one primate - have been specially bred to create a 'diseased' population of animals to use in laboratory tests. All five have the same DNA altered, which has resulted in symptoms similar to the human conditions of anxiety, depression and schizophrenia. The quintet were born at the Institute of Neuroscience (ION) of the Chinese Academy of Sciences (CAS) in Shanghai. Researchers used the same technique as was used last year to produce Zhong Zhong and Hua Hua – the first ever two cloned monkeys - and Dolly the sheep, famously cloned in the late 90s in Scotland. The animals will be destined for a life in a laboratory and the scientists claim the gene-edited primates will be used to test groundbreaking new treatments for diseases ranging from brain disorders to cancers. But this latest move will inevitably raise ethical questions about the future of human cloning - and how close modern science is moving towards gene-edited clones. China has also been rocked by controversy after scientist He Jiankui claimed to have created the world's first genetically edited babies. State officials say he acted illegally in pursuit of fame and fortune. Scientists hope that by repeating this process they can create one animal that exhibits the right symptoms and then use this as the future blueprint for all clones. Cells from a donor monkey were used to create the clones. 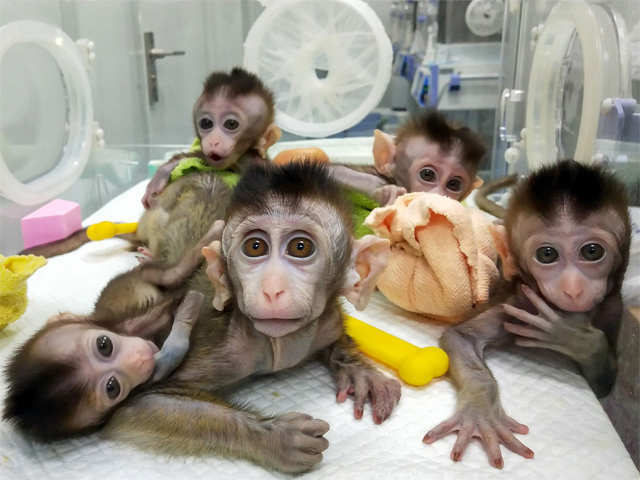 A process known as somatic cell nuclear transfer (SCNT) was used to create the animals and it is the same procedure used to generate Zhong Zhong and Hua Hua, the first two cloned monkeys, and Dolly the sheep back in 1996. 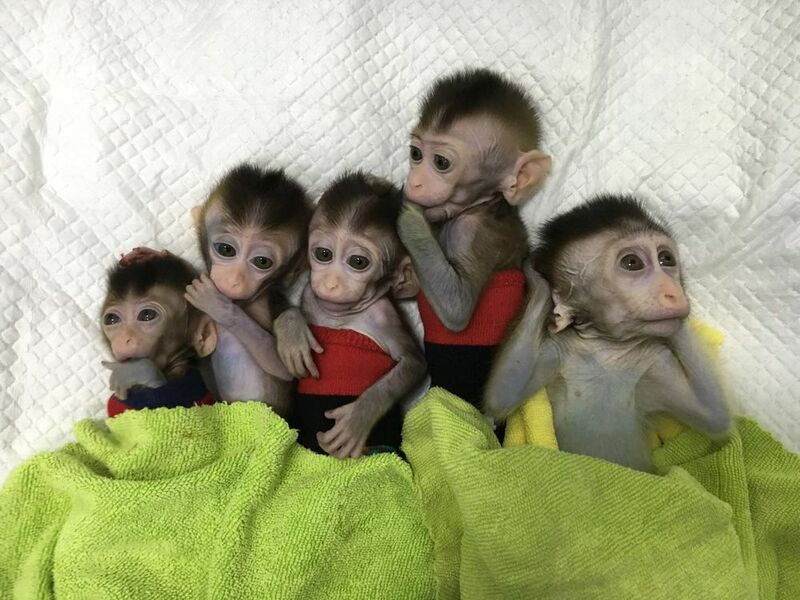 Chinese scientists say the advance, reported online by the journal National Science Review, said the cloned quintet showed signs of a wide-range of symptoms associated with the loss of BMAL1. The donor animals had this section of DNA deactivated via the famed gene-editing technique Crispr-Cas9. This powerful tool allows scientists to manipulate genetic material and the changes are permanent and passed on down the generations. It is also the technique allegedly used by Dr He Jiankui in China to create the first genetically modified human babies. A pair of twins were created to be resistant to HIV by the now ostracised and disgraced academic. He received huge backlash from his work due to the heinous ethical violations. To create the monkey clones, Chinese researchers removed the nucleus from a monkey egg cell. This was then replace with the nucleus from another cell in its body - from a fibroblast, a cell that creates collagen. A fibroblast is a somatic cell, meaning it comes from the body not the reproductive organs, and this provided the egg with the full compliment of chromosomes. Egg and sperm cells undergo a process called meiosis where they half their chromosomes and rely on fertilisation to occur for the full set to be completed. Once the fibroblast nucleus was implanted in the egg cell, the embryo was cultivated and differentiates until it forms a complete organism. This is an identical copy of the original animal, flaws and all. The embryo is implanted into the womb of a surrogate monkey that eventually give birth to the clones. Zhong Zhong and Hua Hua hit headlines last year when they were born using the same method with cells from an aborted foetus. The researchers plan to continue improving the technique to increase the efficiency of cloning. They are expecting more macaque clones carrying disease-causing gene mutations to be generated in the coming years. But they said the Institute of Neuroscience follows strict international guidelines for animal research. “This work required coordinated efforts of many laboratories, and serves as a clear example of the efficient team work that is highly emphasised by CAS. This line of research will help to reduce the amount of macaque monkeys currently used in biomedical research around the world.